Just in time for your Mother’s Day, Memorial Day, July 4th, or Labor Day celebration! This quick, easy salad is packed full of flavor, healthy ingredients, and versatility. This will serve four as a side dish, and goes well with a simple grilled steak, salmon, or even chicken. 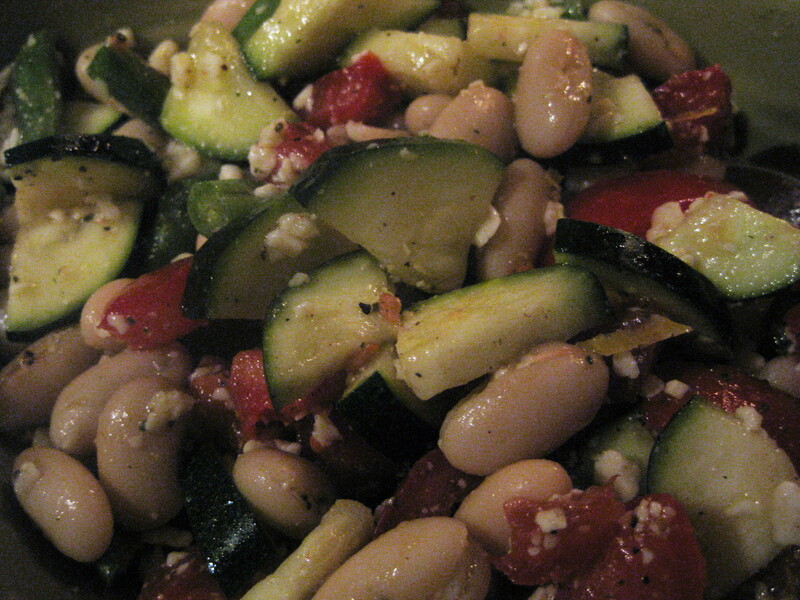 Originally inspired Martha Stewart’s White-Bean Salad with Zucchini and Parmesan, I felt that adding one simple ingredient and a little more oil sent an already-delicious recipe over the top. 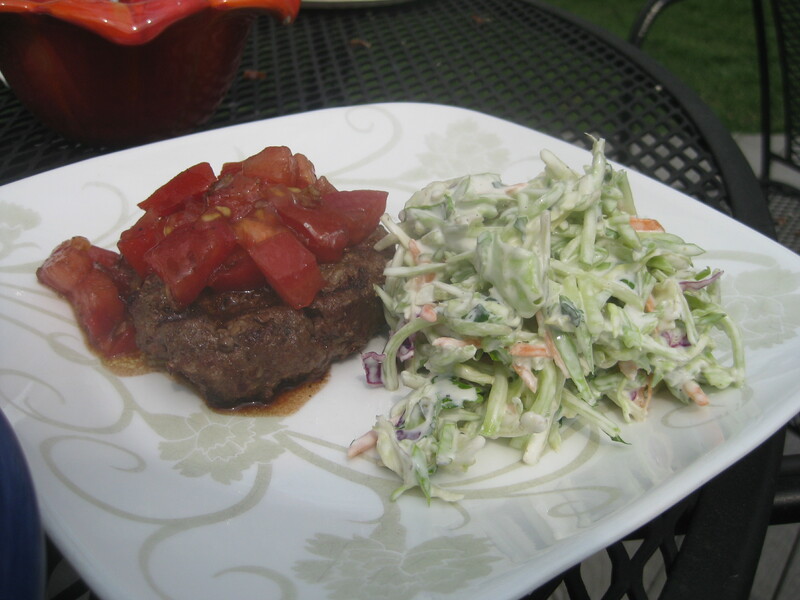 Perfect for people on South Beach Diet, or for anyone trying to eat healthier. Admittedly, when I first read Martha’s version, I wasn’t sure how I’d like raw green beans and zucchini in a salad. But, as the Iron Chef says: “with an open mind and empty stomach”, I recalled that I once had the pleasure of attending a cooking class offered by Chef Charlie Trotter, now known for his involvement in the raw food movement just before his book was published, Raw, (co-authored by Tim Turner). I’d also had the pleasure of dining at Trotter’s restaurant in Chicago – and despite the big-ticket it came with – my socks were knocked off. All of my doubts disappeared the first time I made Martha’s recipe, and as often is the case, I was inspired to make it even better. This easy yet impressive recipe serves 4 as a side dish. I double-dog dare you to eat raw! In a medium bowl, place cannellini beans, zucchini, green beans, tomatoes, Parmesan, basil, lemon zest and juice, and oil; season generously with salt and pepper. Toss to combine. I love this with grilled salmon or steak and a crusty Italian bread to soak up the extra dressing. One of my summer choices for a healthy burger is this recipe – what was originally inspired by a recipe called Chicken Burgers with Warm Mushroom Salad. I thought the original burger recipe itself had potential, so I just changed it up a bit and made it even better. 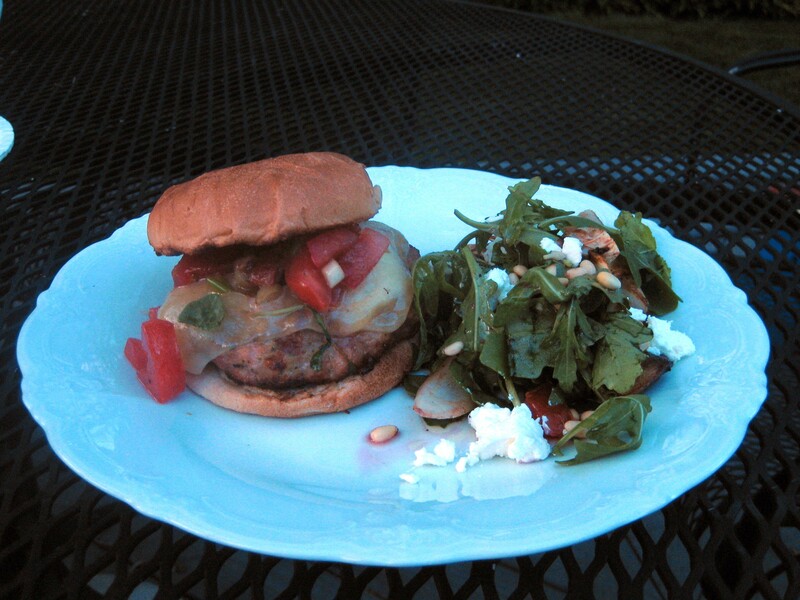 Admittedly, I do my own thing on the salad – I don’t think her salad recipe does the burger justice. I followed the notion of involving mushrooms in the side dish, however, since it is in keeping with the Italian influence and compliments the burger well. Wait till you taste these! I have to give credit where it’s due. In her 2003 cookbook, More Low-Carb Meals in Minutes, Linda Gassenheimer collected and created and some wonderful gourmet-inspired recipes that are appropriate for many of the more popular low-carb diets. It targets diet crazes such as Protein Power, Atkins, and now, South Beach Diet. I refer back to this book frequently when I am in Phase One of the SBD, for something more inspiring than lean chicken and a pile of roasted vegetables. This is an excellent supplement for the SBD books because it has beautiful pictures and recipes that are a step up from the menus in the original diet plans, and most are quick and easy to make. Since that book was published, there have been more, updated versions – equally beautiful and with great new recipes, and I intend to purchase this one called Good Carb Meals in Minutes, which is geared for the latter phases of low-carb diets and appropriate for anyone who just wants to eat healthy, delicious meals and not spend an hour in the kitchen doing so. My modified recipe takes about 30 minutes, so if you’re using a charcoal grill (which I prefer), light it up and get started. Makes 6 burgers. In a large bowl, gently mix together the ground chicken, ground sausage, pesto, salt and pepper. Take care not to overwork the meat, as is it easy to toughen. Form into 6 patties, about 4 inches in diameter and 1/2 inch thick. Place on a plate or platter and refrigerate until ready to grill and prepare side dishes. In a medium bowl, mix together the tomatoes, scallions, and dressing. Season to taste with salt and pepper. Set aside. Cook burgers: Heat grill to medium. Oil the grates well with vegetable oil (chicken burgers stick easily). 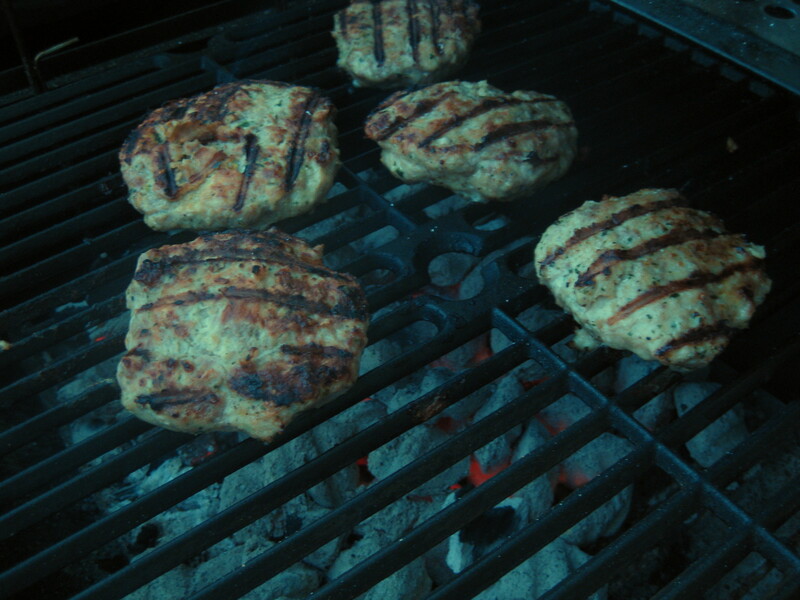 Grill patties, turning only once, about 6-8 minutes per side. During the last minute of grilling, top burgers with Gouda slices, put cover on grill down until just melted. Serve on toasted or grilled whole-wheat sandwich buns and top with tomato mixture. Phase One dieters, serve without buns or open-face with one slice of toasted whole-grain bread. I’ve been o n South Beach Diet Phase One now for 2 weeks. Having gone through the phases before, I get bored quickly with the recipes in the book. 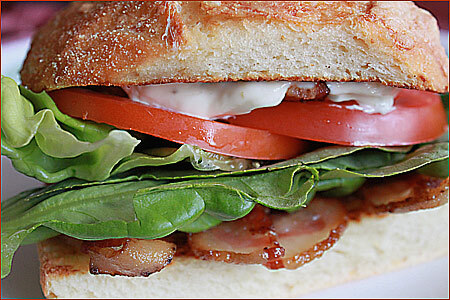 Today, I was craving a BLT sandwich. As the man says, “pork fat rules” (Emeril). So, I concocted this simple salad to satisfy my craving. Not only did it come together in five minutes – but it completely satisfied my desire for that delicious bacon, lettuce and tomato sandwich that mom used to make – sans the bread. The recipe that follows makes one serving. Spray a non-stick skillet with cooking spray (or, alternatively, brush the bottom with a little vegetable oil). Over medium heat, cook the bacon in the pan until just browned a bit, about 2 minutes per side. Transfer to a paper plate or paper towel to cool slightly, then chop into 1/2 inch pieces. Set aside. In a small bowl, whisk together the mayonnaise, milk, lemon juice, salt, and pepper for your dressing. Arrange greens in a serving bowl. Spoon dressing over greens. Top with chopped tomatoes and Canadian bacon. Variations: add diced avocado, chopped hard boiled eggs, or cubed cheese (remember though, this adds more fat content and, in my opinion, is not necessary). I may try a few slices of cucumber or red onion next time; but for a true craving, I wouldn’t want to interfere too much with the integrity of the original BLT. 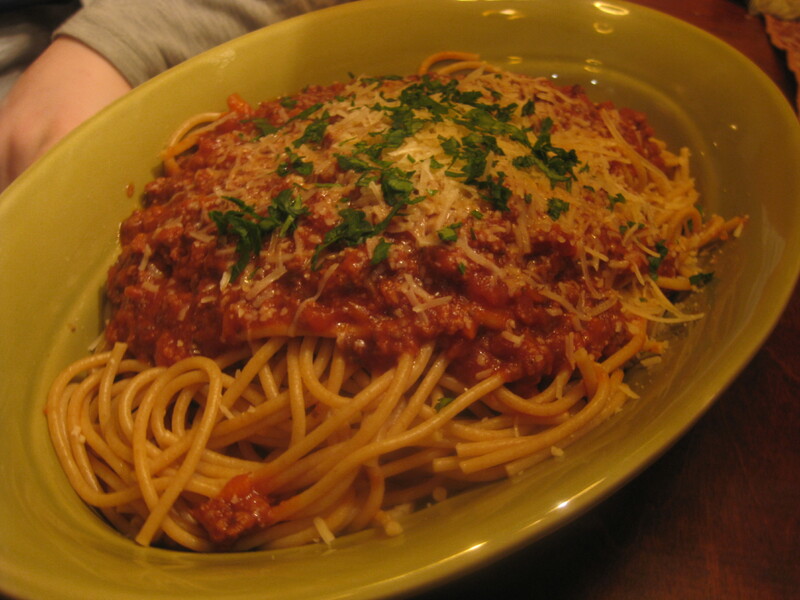 A classic dish, Spaghetti Bolognese was difficult to categorize in this article, because its origin is arguable. While the concept of this meat sauce originated in Northern Italy in the “Bologna” region, the French would often take food influences from bordering countries and adopt their own recipes, still naming the dish by its inspirational region. While it’s not exactly “quick”, it’s definitely easy, and much of the time is simmering. Clearly, the idea of saturating food in wine is French. I could spend more time and research to ascertain which came first – Bolognaise, the French spelling, or Bolognese, the Italian spelling – but this is a cooking site and not a history blog. So, to make everyone happy, I’ve put it both categories. And now, on with our favorite family recipe! This version of a classic recipe began with my mom-in-law, a French native and a fabulous cook. Made traditionally, it simply was not palatable for my American kids. 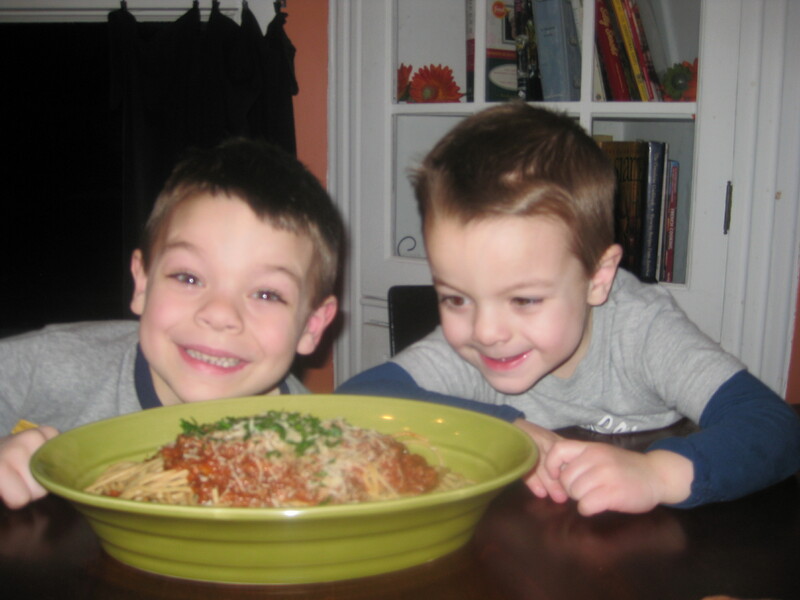 I don’t give up easily, and want them to be exposed to all tastes – so they can grow up to be foodie aficionados. 🙂 Here, I’ve reduced the amount of wine and chopped up the veggies finely enough to appeal to the kids, but have not lost the integrity of the sauce. White shredded cheese of your choice to serve: French like Swiss for this dish, Italians like Parm – you decide! In a large sauce pot or dutch oven, heat the oil over medium heat. Add the onions, carrots and garlic to the pot; saute for a few minutes until softened. Add the mushrooms; continue to cook, stirring occasionally, about 4-5 minutes. Add a little salt and pepper. Stir in the tomato paste. Add the stock, wine, tomato puree, seasoning, and bay leaves. Bring to a boil. Reduce heat and simmer uncovered, stirring occasionally, about 20 minutes. Season sauce to taste with salt and pepper. Meanwhile, follow the directions on the pasta package for cooking the noodles. I prefer my noodles a minute or two after al dente, as usually recommended – just do them how you like – people are funny about texture. While the pasta is cooking, begin crumbling tiny pieces of the ground beef into the sauce with your fingers. Don’t worry about making anything symmetrical; the pieces of beef will shrink with cooking and just be tiny bits of meaty goodness. Avoid large chunks of meat. This will take a couple of minutes, and will be done about the same time as your pasta, so it works out well. Stir all the meat into the sauce until it’s incorporated. Cover the pot; simmer another 10 minutes. Longer is not necessary and will toughen the meat; thereby defeating the purpose of adding it at the end. Drain your pasta, and return it to its pan. Spoon one ladleful of sauce into the noodles. Toss to coat. To serve, pile noodles into bowls. Top with additional ladles-full of sauce; top with shredded cheese and minced parsley. I like it with crusty bread and olive oil for dipping, a green salad, and an abundance of red wine! It’s grilling season! 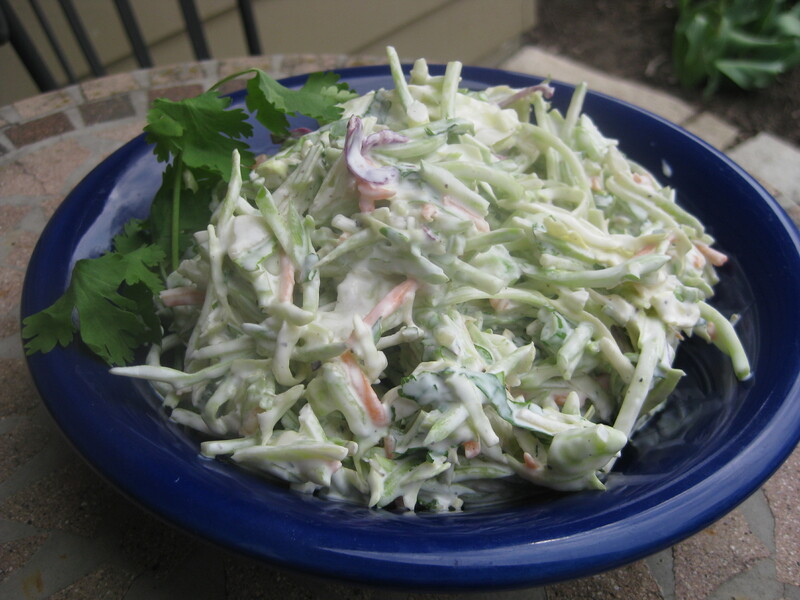 I’m alwa ys looking for new side dishes that interest me more than the usual cole slaw and potato salad. When you’re in a hurry, throw this great 5-minute broccoli slaw together and wait for friends and family to ask for the recipe! Kid-friendly, and healthy too. Great with grilled burgers, fish, and pork, or alongside Mexican-inspired main courses. In a medium bowl, whisk together the first six ingredients. Toss in the broccoli slaw mix. Season to taste with salt and pepper. Serve immediately, or chill for up to 30 minutes to allow flavors to meld. Serves 4-6 as a side dish. What I like best: quick, easy, delicious – and not too sweet – though you can use more sugar or some honey for a little more sweetness if desired. For South Beach Diet Phase I, substitute Splenda for sugar. W hat, you say? “Fabulous” and “Meatloaf” seemingly don’t belong in the same title. Once you try this, you’ll change your mind. It’s EASY, but actually on my list of company-worthy – one I intend to serve to French guests that are expected in July. It’s a wonderful blend of U.S. meets Euro. My camera failed me on this one, so you’ll have to take my word for it that it was nice to look at, too. Not counting the 45 minute cooking time – thrown together in a few minutes. 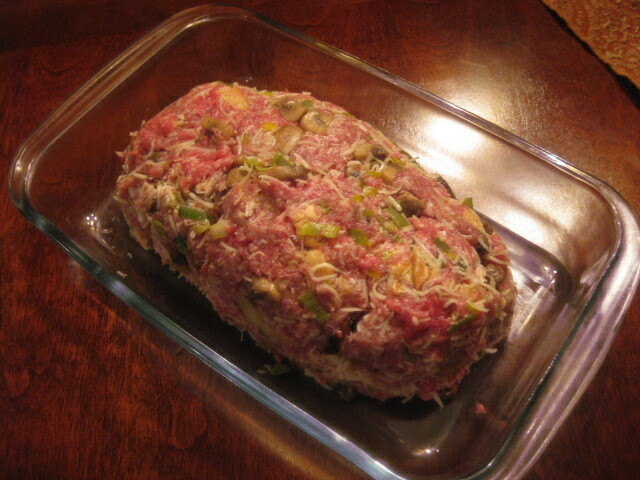 The original recipe was this: Turkey Meatloaf with Fontina and Mushrooms . Martha’s people, as usual, rocking my culinary interests. But for me, I needed to make it a bit more kid-friendly, and the ingredients a little more budget-friendly and mainstream. The result was even better! 1 1/2 pounds ground meat, I use a combination of pork and beef. If you use turkey, make sure it’s the higher fat ground turkey to get the best flavor and proper texture. Preheat oven to 350 degrees. In a large skillet, heat 2 tablespoons olive oil over medium-high. Cook mushrooms, stirring occasionally, until deep golden brown, about 5-7 minutes. Season with salt and pepper; transfer to a large mixing bowl. Return skillet to medium-low and add another tablespoon oil. Add leeks and garlic and cook, stirring occasionally, until soft, about 5 minutes; season with salt and pepper. Add to bowl with mushrooms and let cool. Add cheese, bread, egg, and sage to bowl and mix until thoroughly combined. Mix in ground meats, 3/4 teaspoon salt, and 1/4 teaspoon pepper. In a ceramic or glass casserole (I use one that’s about 8×11), use your hands to form the mixture into a 10-inch loaf. Bake until cooked through, about 45-50 minutes. Let rest , loosely covered with foil, 10 minutes before serving. Drain off any fat and slice in 1/2 inch portions. Serve this the traditional way – with green beans and mashers, but when company comes (and yes! 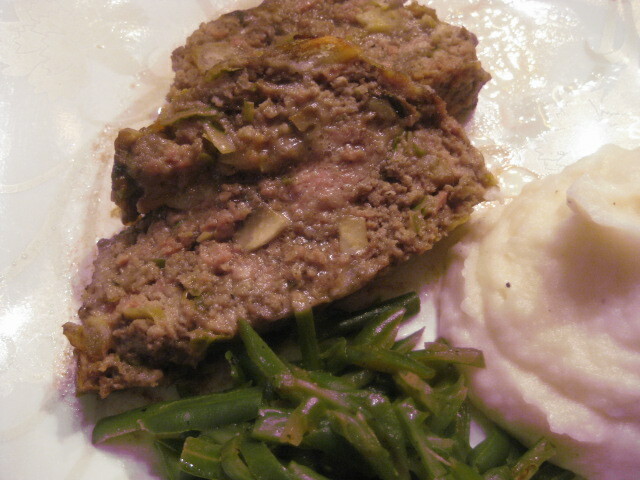 I definitely serve this meatloaf to company) I kick up the green beans and do French haricots (tiny whole green beans) and toss them with butter, lemon zest, pine nuts, and lots of salt and pepper – and then I drizzle the mashed potatoes with a little truffle oil. You won’t need gravy, because the meatloaf is so flavorful and moist. But if you must do anything, use just a light red-wine based juice deglaze type sauce – a heavy beef gravy would just destroy it. You could possibly use a very light tomato sauce because it would be in keeping with the Italian influence of the dish. But unless your guests are under 10, NO KETCHUP ALLOWED! Tasty, impressive, healthy, budget-worthy, kid-friendly! I gathered ideas from a few different recipes and made it into my own. Every time I make it, yums and ahs abound. Next time your family is screaming for tacos – see what happens with this. Place the breadcrumb/saltine mixture in a shallow dish. In a small bowl, whisk together the egg, water, and taco seasoning. Pat the tilapia pieces dry with a paper towel, and then season them with salt and pepper. Working with a few pieces at a time, first dip the fish in the egg, letting the excess drip off; then coat the fish pieces well with the breadcrumb mixture. Place the coated pieces on a clean plate. Repeat until all the fish is coated. Now heat two tablespoons of the vegetable oil in a large, non-stick skillet over medium heat. When hot enough to sizzle from a drop of water, add half of the coated fish pieces to the skillet. Fry the fish pieces for about two minutes on each side, until golden and crispy. Transfer the cooked fish to a warm plate lined with paper towels. Cover loosely with foil while you fry the second batch. 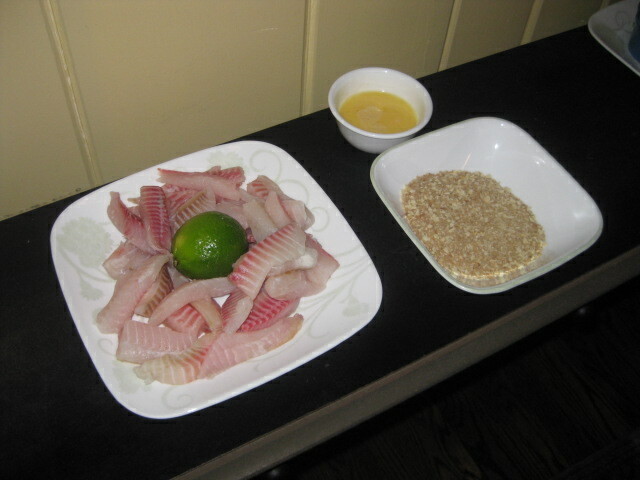 Add the remaining tablespoon of oil, if needed, and repeat the process with the remaining fish pieces. In a medium bowl, whisk together the mayonnaise, sour cream, lime juice, sugar, and salt and pepper to taste. 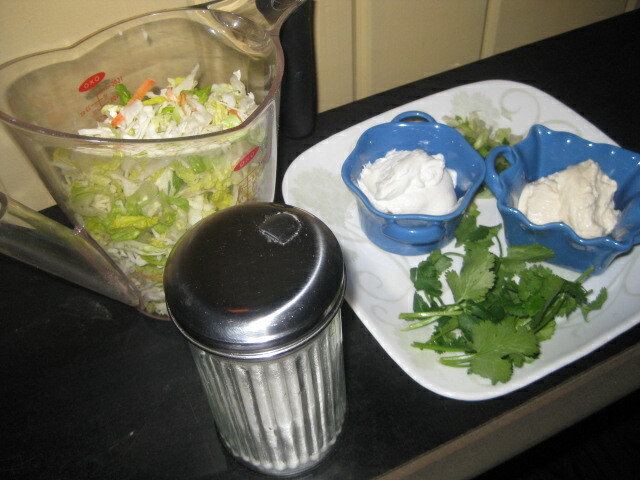 Stir in the coleslaw, green onions, and cilantro. To serve, assemble tacos with two or three pieces of fish in a warm corn tortilla, topped with a tablespoon or two of the slaw topping. On the side I always serve black beans with some grated Mexican cheese called cotija, but crumbled parmesan or romano works equally well. And, if you want the kiddies on board (my kids love the fish tacos, one of them without the slaw..) serve with refried beans topped with shredded cheddar. A great way to get them to eat fish that is not processed! TORTILLAS: Two ways to warm! For over-the-top excellent taste and texture, use your non-stick skillet with a tiny bit of oil to toast the tortillas – then stack them in tin foil to keep them warm for serving. This takes a little time, but is so much better than the alternative! 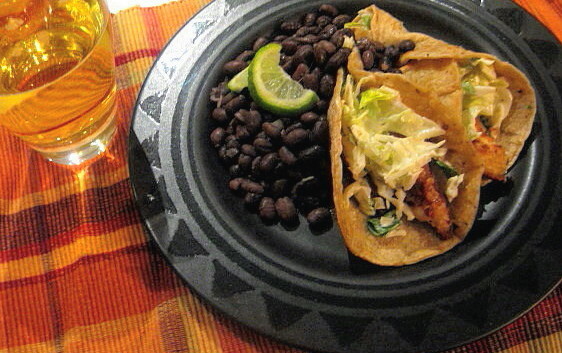 Seriously, you made these great fish tacos, don’t shortcut the wrapping. Wrap about 8-10 corn tortillas in damp paper towels; heat in microwave for 20 seconds. With this step, I could put this recipe on the “quick and easy” category or tag list, but I chose not to, if you really want it to be great spend the extra five or ten minutes!